Live text commentaries on BBC Sport website from 1000 BST; updates & commentary on BBC Radio 5 live, 5 live sports extra and online. Live on Eurosport. For what seems like an eternity, the Grand Slams have served up arguably the most breath-taking sporting performances on the planet. 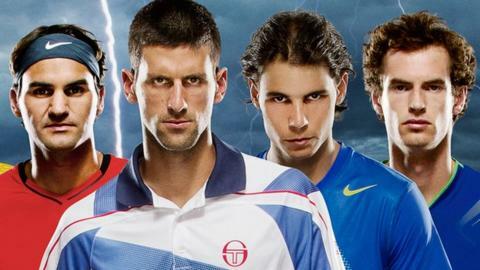 The heights scaled by Novak Djokovic, Rafael Nadal, Roger Federer and Andy Murray always seem unlikely to matched - until the next Grand Slam rolls around. It's hard to look beyond the big three. Or even perhaps the big two. It's an amazing time at the top of men's tennis and as Djokovic goes for an incredible four majors in a row, Nadal tries to stop him like he did so emphatically on the clay of Monte Carlo and Rome. Federer will want to prove a point - he looked in great shape in Madrid - and he feels, at the start of this hectic summer, that someone else could be about to gatecrash the big league. Could it be Murray? Maybe, although he's short on matches. Del Potro? Tsonga? Form suggests Tomas Berdych, in excellent nick, is perhaps someone to watch this fortnight. Taking the last two as an example, the US Open semi-final between Djokovic and Federer, followed by the Serb's final win over Nadal, were classics, only for the bar to be raised at the Australian Open. After the drama of semi-final wins for Djokovic over Murray and Nadal over Federer, came the unbelievable marathon final, with Djokovic again prevailing. It is that success in the early hours in Melbourne that leaves Djokovic on the cusp of history at the French Open. Victory in Paris would see the world number one become the first man to hold all four Grand Slam titles simultaneously since Rod Laver in 1969. But it is not only Djokovic who has the opportunity to rewrite the record books. Former British number one Greg Rusedski gives his verdict on the men who can make history at Roland Garros. Form: Won the Australian Open in January, and the Miami Masters in March, but has not tasted victory in the three clay-court tournaments he has played. Lost in the quarter-finals on the controversial blue clay of Madrid and, more importantly, was beaten in the finals in Monte Carlo and Rome by Nadal. How he can make history: If Djokovic, the winner of the last three Grand Slams and four of the last five, wins at Roland Garros he would become the first man to hold all four majors since 1969, an achievement made all the more remarkable considering that his two biggest rivals, Federer and Nadal, have won 26 Slams between them. In Olympic year, the world number one would be on course to win a calendar 'Golden Grand Slam'. Rusedski's view: "It would be one of the biggest achievements in tennis history. With the competition level at the moment, I don't think it's something we would see again in our lifetimes. But it's going to be so difficult, because Nadal is winning everything on clay at the moment. Winning the last three majors will give him so much confidence, but the French is the hardest for anyone to win because of Nadal. If Djokovic does it, he would have a great chance of winning all four this year." Form: Discounting defeat in Madrid, Nadal is flying. The Spaniard arrives in Paris on the back of three clay court titles, two of which have come courtesy of final victories over Djokovic, including regaining the Italian Open from the Serb. However, it is Djokovic that has triumphed over Nadal in the last three Grand Slam finals. How he can make history: Victory would give Nadal, currently level with Bjorn Borg on six French Open titles, a record seventh crown at Roland Garros and cement his reputation as the greatest clay court player of all time. The world number two would also join Borg on 11 career Grand Slam titles, behind only Federer (16) and Pete Sampras (14). Rusedski's view: "What Rafa does on clay is superhuman. To win seven French Open titles would be ridiculous, something you would only see once every 100 years. Borg retired at the age of 26, Rafa is only 25, so he will have passed him at an earlier age. There's no argument in the discussion; Nadal is the greatest clay court player of all time. Don't be surprised if he adds a few more French Opens on to what he has already won." Form: While the other big names struggled in Madrid, Federer got to grips with the blue clay and took the title. Prior to that, the world number three had won 17 consecutive matches and four successive tournaments - a run that was halted with defeat by Andy Roddick in Miami. His last outing on clay was a run to the semi-finals in Rome, which ended with a semi-final loss to Djokovic. How he can make history: If Federer wins his second French Open title he would become only the third man to complete a career Grand Slam twice. The Swiss would also be only the 11th man to win a major after his 30th birthday, and extend his record for the most Grand Slam titles in history to 17. Rusedski's view: "You can only go off statistics, and they say Roger is the best in history. The longevity and the ease of movement is perfection. Mentally and physically to be able to do what he is doing at the highest level, I have never seen before. The man is a phenomenon. For him to win the French Open and complete a second career Slam would be a Herculean effort, one that is most likely to have to include a win over Nadal, and that would need a phenomenal performance." Form: Mixed. Reached the Australian Open semi-finals and the Miami final, but has only twice beaten another member of the top four this season, and one of those came when Nadal pulled out injured. Has failed to get past the last eight in three clay-court outings, but the world number four has been consistent at the recent Slams, not failing to reach the semi-finals since the 2010 US Open. How he can make history: A Murray victory at Roland Garros would make him the first Briton to win a Grand Slam since Fred Perry in 1936. He would also be the first Slam winner other than Federer, Nadal and Djokovic since the 2009 US Open and only the fifth different champion in 30 majors. Rusedski's view: "It gets harder every year for Murray to win his first Slam. I was optimistic for him at the Australian Open, and taking Djokovic to 7-5 in the fifth set was probably his best performance at a major. It's going to be a big ask for him to win the French Open, but he's got the right man in his corner in Ivan Lendl. In his three previous major finals, Murray has gone in tentatively, while the other top guys go after it. Murray's style is to counter-attack, and that's a big habit to try and change." Rusedski's view: "I can't see an outsider winning it, but I can see someone causing a shock and sending one of the top guys out. The Canadian Milos Raonic is a huge threat, he has an absolute cannon of a serve, as has the American John Isner. Thomas Berdych has just got to the final in Madrid, while Juan Martin Del Potro was the last man other than the top three to win a Slam. Jo-Wilfried Tsonga and Richard Gasquet will be dangerous in their own country too."